Tell Lord Vader to get stuffed and there will be consequences, like a new and exciting posting on a backward agricultural planet. 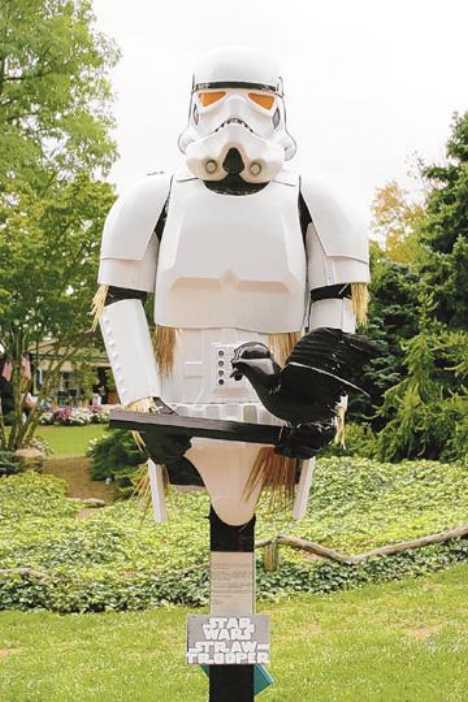 At least an old vet can dream… Those rebel crows don’t stand a chance with a Strawtrooper on guard. If he doesn’t wing one with his E-11 blaster rifle, you can guess what’s next: the dreaded tractor beam! You can take the scarecrow out of the farm but you can’t take the farm out of The Scarecrow… the funny farm, that is. 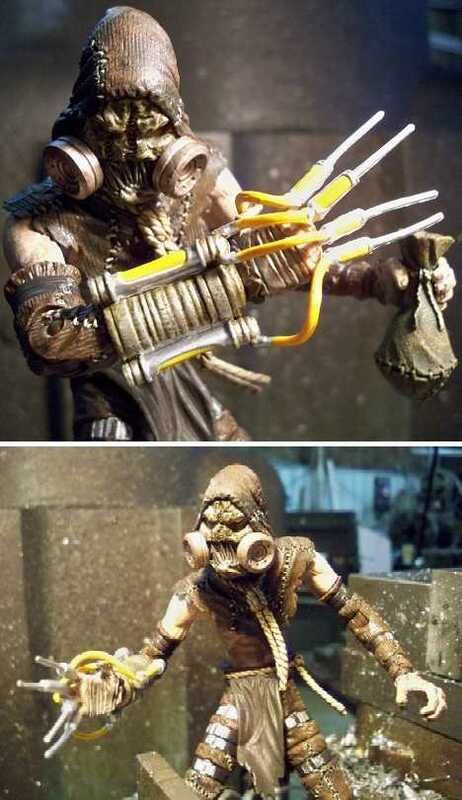 The DC Comics supervillain escaped from Arkham Asylum, emerged as one of Batman’s more formidable foes and has been rendered in fearfully intricate detail via DC Direct’s line of Batman: Arkham Asylum toys and figurines. Think Freddy Krueger’s tough? 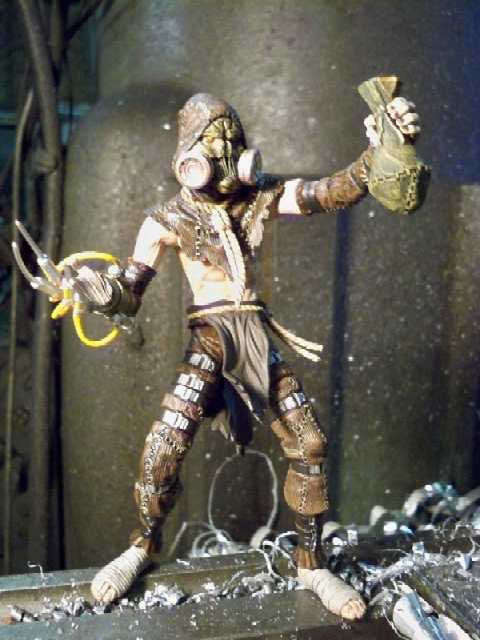 In the video game Batman: Arkham Asylum, The Scarecrow tops the nightmarish fiend’s bladed glove with a hand-mounted battery of hypodermic syringes rigged to inject a wicked soup of fear toxins. Now that’s something worth crowing about. 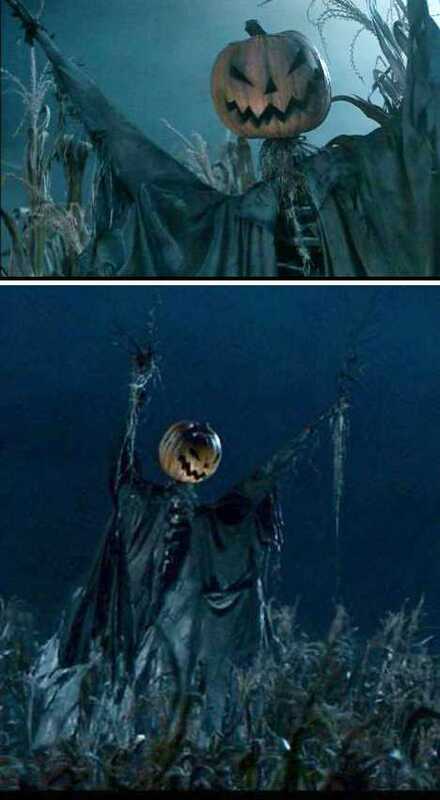 Leave it to master of horror Tim Burton to come up with one of the scariest scarecrows filmdom has ever witnessed: the grinning, pumpkin-headed apparition from 1999’s Sleepy Hollow. 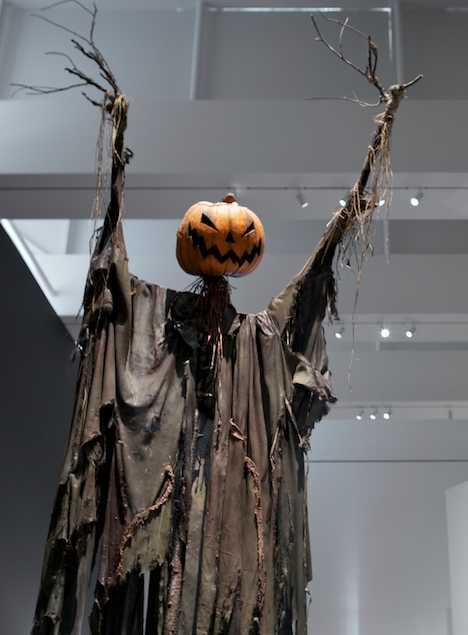 The Sleepy Hollow Scarecrow was part of the massive touring retrospective of Tim Burton’s creative work that made stops in Toronto, Los Angeles, Melbourne and New York. If the scarecrow looks somewhat the worse for wear, chalk it up to the length of the tour and the rigors of long distance travel – a few rock stars we won’t mention display a similar level of deterioration. In the future, all scarecrows will be German – when “Die Vogelscheuche der Zukunft” (“The scarecrow of the future”) shouts “Achtung! Achtung!” at approaching crows (or Spitfires), who’s gonna say “Nein”? 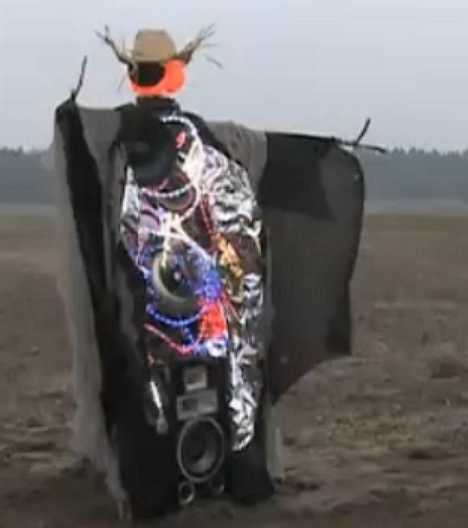 Created to star in a commercial for Conrad, the German version of Radio Shack only less sucky, Roboscarecrow waves his arms, flashes lights and unleashes a blast of wind. Das poot? 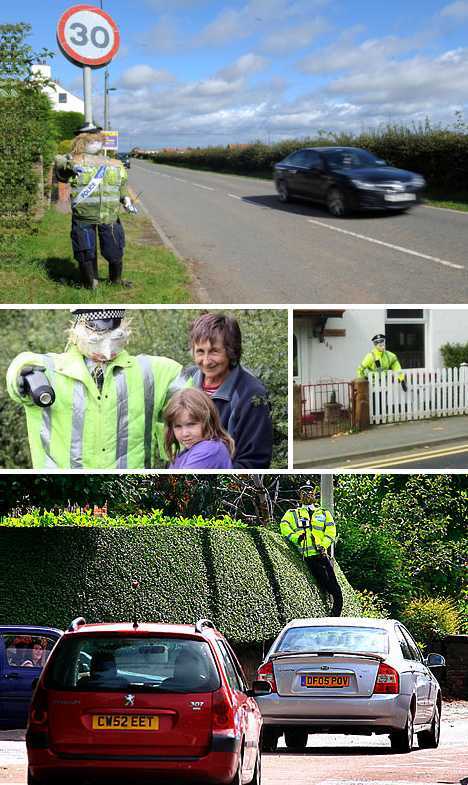 Presumably short on actual living police officers, a number of constabularies in the UK are employing (so to speak) scarecrows to perform boring and unpleasant (being out in the English weather) duties such as waving radar guns at presumed speeders all day long. At least that’s how it appears from the drivers’ perspective – usually the radar guns are fake as well though they may not actually be stuffed with straw. The gambit has been so successful several private members of the public are crafting homespun versions of “PC Speedy” to help slow down traffic on their streets. 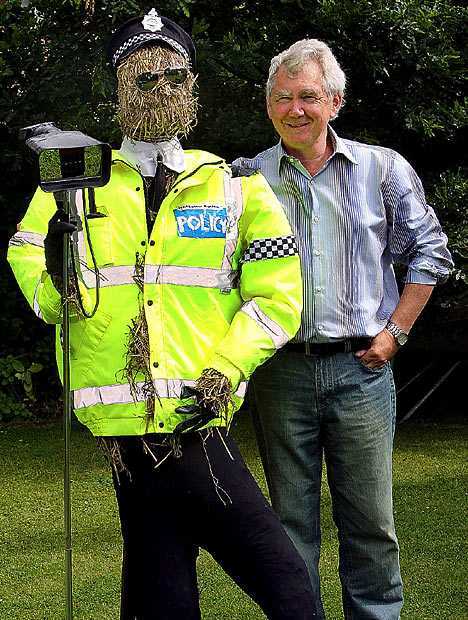 The professional Peelers have a problem with this, however, which will be solved when the scarecrows form their own union to protest the use of recycled store mannequins as dummy police officers. Scarecrows just don’t get any respect, regardless of recent attempts to rehabilitate them as frightening features of fantasy. Maybe it’s because of the central inconsistency behind their existence: scarecrows don’t really repel crows and crows don’t really eat crops – rather, the black birds benefit farmers by eating the insect and rodent pests that eat crops. 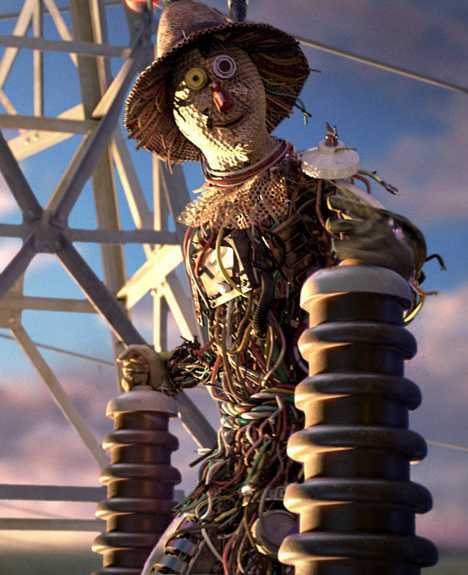 Laugh at “brainless” scarecrows all you want but just remember, they’re only as smart as their makers.